Cloud computing is classifed as a kind of computing which based on sharing computing resources rather than having local server or personal devices which can manage applications. Cloud computing is a technology which employs the internet and central remote servers to maintain data and applications. Cloud computing facilitates business and consumers to use applications without installing and accessing their personal files at any computer with just internet access. With this technology computing can be much more efficient by centralizing data storage, processing and bandwidth. 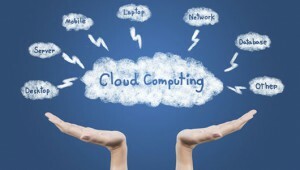 Cloud computing is nothing but delivering hosted services over the internet. Cloud computing, the word “Cloud” narrates as image for “the internet”, so the phrase cloud computing means, “ a category of internet-based computing”, where special services – like servers and storage and application – are distributed to an organization’s and devices through the internet. The main objective of cloud computing is to manage traditional or high-performance computing power, which generally used by military and research facilities, to execute consumer-oriented applications like financial portfolios, to deliver personalized information, to facilitates data storage or power large, immersive online computer games. To perform these tasks, cloud computing uses network of large group of servers which typically rus on low – cost consumer PC technology with specialized connections to spread data processing chores across them. This shared IT infrastructure contains large pools of system which are connected together. Very frequently, Virtualization techniques are used to maximize the power of cloud computing. Self- service provisioning: End users can twist up computing capital for the almost any type of workload as per the demand. Elasticity: companies or business organization can increase computing or reduce computing demand as per the demand. Payment as per the use: computing resources measures at a rough level, where users need to pay only for the resources and workloads they use. In the conversation of Cloud computing system, it will be easier to divide it into two sections: the front end and the back end. Both the ends connected with each other through a network, mostly the Internet. The front end is the user of computer or client and the back end is the “cloud” section of the system. The front end contains the client’s computer or can say computer network and the application which required accessing the cloud computing system. All cloud computing systems are not necessarily same user interface. Services such as Web-based email programs controls existing web browsers like Internet Explores or Firefox.